I was saddened to hear about the sudden death of Iraqi-British architect Zaha Hadid yesterday 31 March 2016. My initial thought was how young she was at 65 years of age, the same age as my mother. Despite this being the age that us mere mortals would consider retirement, the starchitect Hadid seemed to be in her professional prime. As with the death of all stars the supernova left being is the wave of comments and obituaries attempting to quantify her talent and inspirations to others. In 2004 she became the first woman recipient of the Pritzer Architecture Prize, she received the Stirling Prize in 2010 and 2011 and in 2012 she was honoured in the Queen's Birthday Honours list for services to architecture. In 2015 she became the first woman to be awarded the RIBA Gold Medal in her own right receiving the award only a few weeks ago. Her worldwide practice employs nearly 400 people. 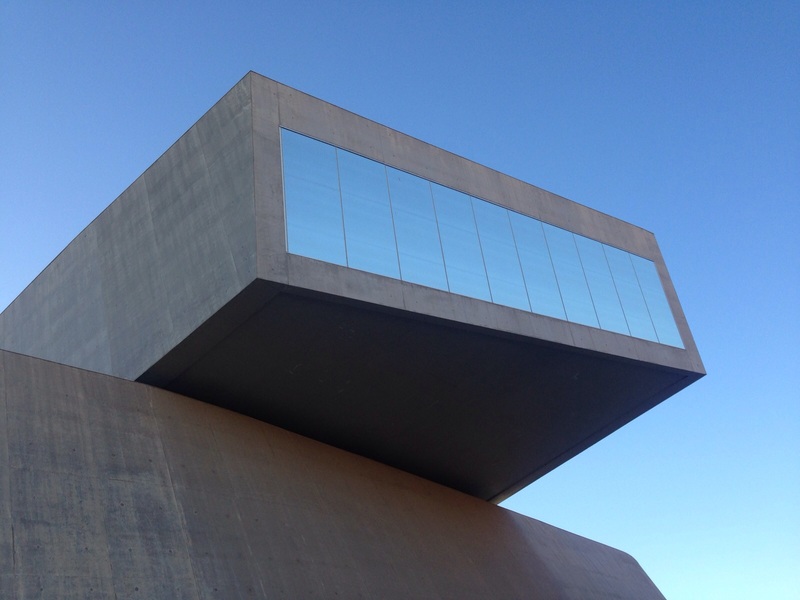 I got to experience the 'wow' factor of Hadid's architecture during a trip to Rome early this year with her MAXXI Museum of XXI Century Arts (2009). Many buildings rely on scale or decadent ornamentation to inspire childlike wonder in the viewer. 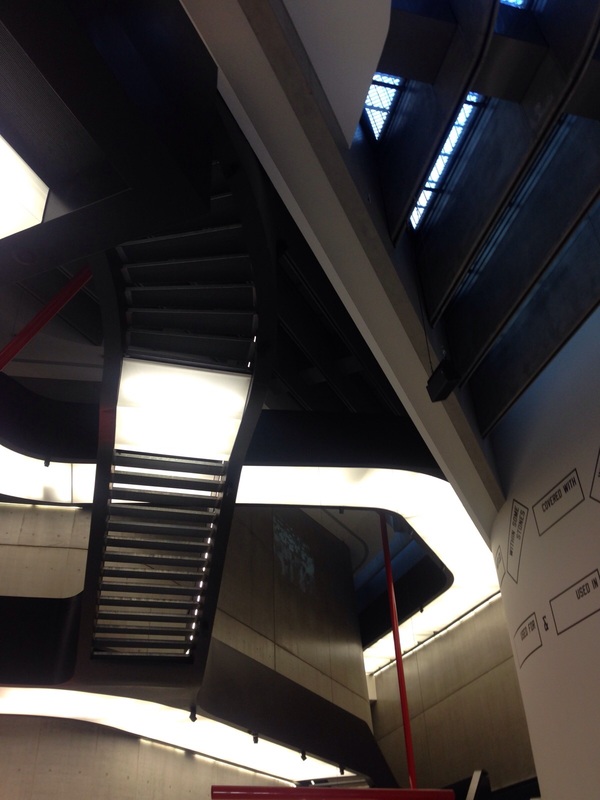 Visitors cannot fail to stop and marvel and the gravity-defying cantilevered top floor and think "how?" Hadid was born on 31 October 1950 in Baghdad. Her London-educated father headed a progressive party advocating for secularism and democracy in Iraq. Her childhood had eclectic influences growing up in Baghdad’s first Bauhaus-inspired buildings and attending a Catholic school where they spoke French where Muslim students were welcomed. Hadid studied Mathematics at the American University of Beirut. In 1972 she began at the Architectural Association School of Architecture in London, a centre for experimental design. She had professors such as Rem Koolhaas and Elia Zenghelis both graduates of the School themselves. Her graduation project was called Malevich's Tectonik, a proposal fro a hotel atop Hungerford Bridge over the Thames. The title was a nod to the Russian avant-garde architect Kazimir Malevich who heavily influenced her work. After graduation Hadid went to work for the practice Koolhaas and Zenghelis established in 1975 The Office for Metropolitan Architecture (OMA) in Rotterdam and became a partner two years later. In 1980 she set up her own London-based practice. It was her early Mathematical studies that contributed to her distinctive, algorithmic style . She was part of the Deconstructivism movement in architecture concerned with shattering and breaking, tough and jagged yet soft, radiating power. It is a style promoted as a successor to post-modern architecture with it's multiple perspective points and fragmented geometry. The Design Museum, London held an exhibition of Hadid's work back in 2007 entitled Zaha Hadid- Architecture and Design. One of the unbuilt projects on display was her entry for the 1979 architectural design competition for an official residence of the Taoiseach (Irish Prime Minister). Zaha's entry was, as she described herself in 'The Complete Buildings and Projects' (1998, p18), "my first major project." The design was entered with the address 84 Portland Road, London under Entry No.11 Eliza Zenghelis with Zaha Hadid under 'Collaborators' column. Thanks to Shane O'Toole I now know that the reason why her entry was submitted under the name of Elia Zenghelis, her former teacher and partner at OMA, was that only professionally qualified architects were eligible to enter, and she was not at that time. But the project is entirely hers. The same situation pertained to one of the joint second entries, designed by Peter Dudley (now of STW, then a 4th year student in UCD) and entered under the names of his tutors, Paul Moore, John Meagher, Yvonne Farrell and Shay Cleary. Interestingly Zenghelis entered a second design with Rem Koolhaus alongside collaborators Alan Foster, Stephano de Martino and Ron Steiner (No. 29). The intended site was in the north west corner of the Phoenix Park along the long diagonal route of Chesterfield Avenue. The images are taken from zaha-hadid.com/architecture/irish-prime-ministers-residence/. Below them is the description of the entry by the practice. The brief also called for a Guest House on the site of the former Apostolic nunciature, at a cost of approximately £4 million. The prize of £6000 was allotted for the winning practice and £2000 for the runners up. The winning design was produced by London firm Evans & Shaler Architects. The practice of Eldred Evans and David Shaler was established in 1965 and had previously won design competition for Broadclyst Village for the National Trust in Devon and later in 1981 they produced the winning entry for the Royal Military College Library in Shrivenhan. The Assessors' Report for the competition is dated 10 October 1979 (NLI holding). In December that same year, mere weeks after becoming Taoiseach Charlie Haughey scrapped the plan of his predecessor Jack Lynch. A close second in the competition was Design No.8 by de Blacam & Meagher in collaboration with QS Austin Reddy & Co. and Consulting Engineers ARUP & Partners. Joint Second Place was No.17 Julyan Wickham & Desmond Lavery (London) and Moore Meagher Farrell & Cleary with an address of UCD School of Architecture. Commended was Toal Ó Muíre & Emer Ó Siochrú and the practice Ivor Smith & Cailey Hutton (Bristol). Most of the Entries were from Ireland and the UK with the odd one further afield like West Germany. No.12 John Tuomey (would later become odonnell-tuomey.ie/) with Drawing Team of Paul Keogh and Rachael Chidlow. Paul's chances of being on the winning team were doubled as he was also collaborator alongside Michael McGarry on Sheila O'Donnell's entry (No. 87). No.93 sees Don O'Neill and the late Jeremy Williams with collaborator Freddie O'Dwyer. There is RKD Architects (61), Grafton Architects (76), Delaney MacVeigh & Pike, Patrick & Maura Shaffrey, Robin Mandal (58), Gerry Cahill (52), Noel Dowley (49), Peter & Mary Doyle (35), Sam Stephenson (28), and No.23 was Edward Jones, Malcomn Last & David Chipperfield (23). You might wonder why I went to bother of typing out the entry numbers. When you read below you might find yourself scrambling to cross-reference the numbers as I did. In general, the standard of the entries reflected the complexity of the brief, only a minority showing a sensitive appreciation of the requirements. The most common defects were a weakness in the integration of the several components of the plan and a failure to establish an appropriate relationship between the main elements, the Residence and the State Guest House. Many competitors also ran into difficulties with the link for informal communication between the two elements and in relating the medieval tower to the new buildings. It was of interest to find that only four entries sought to retain the 18th century Villa. While detailed attention was paid to these in the assessment, the Assessors considered that they failed because the Villa could not be related successfully in scale to the total complex. Some thirty-four designers incorporated the old stable buildings and, in many cases, made use of them in a sensitive way. After detailed examination, the Assessors selected fifteen entries which, appeared to have an especial merit and potential as acceptable schemes. They were Nos. 1, 8, 14, 17, 19, 35, 36, 48, 57, 59, 60, 66, 70, 78 and 91. In their final appraisal, the Assessors narrowed the list to the four entries which showed the highest quality: Nos. 8, 17, 36 and 91. Of these they decided that entry No. 91 was the best and was of a quality which would warrant its adoption and execution and, with some feasible modifications, would meet all the Promotors' requirements. A well-developed and detailed scheme, entry No.91 fulfills the planning and accommodation requirements with interesting space relationships, both internally and externally, and it has a pleasing human scale. The layout is sensitive to the site and keeps ,much of the present screening, making the best of its surroundings. The three other entries in the final grouping, No.8, 17 and 36, were felt to represent three differing but acceptable solutions to the main requirements of the brief though they would require development and improvement to make them suitable for adoption. It would be difficult to separate them on merit and they were therefore placed jointly in second place, that is, with a prize of £2,000 each. It is to be noted that the effect of perfecting them would certainly lead to increases in cost. Project No.8 was favoured for its distinctive architectural quality and its sensitiviety in detail and conception. There were aspirations regarding certain aspects of the planning of the buildings, including the location of the Taoiseach's private apartments and the absence of an entrance hall as envisaged in the brief. There is also an undue emphasis on the walled garden to the detriment of the siting of the Guesthouse. But it was noted that the competitor had made a serious practical endeavour to incorporate examples of the best Irish furniture and modern art. I don't think it would make seen to build the unrealised designs as they are now. If you do them again, they're going to have to be an interpretation of what might have been... (Massimo De Conti Design Talks: Contemporary Creatives on Architecture and Design (Images Publishing: 2012, 55). During an interview for BBC Radio 4's Women's Hour in 1995 after the Opera House fiasco Hadid commented "you cannot respond to something just by looking at the image of a building because it's not all about that. It's about how the building works." As powerful as her designs is her legacy that the next generation of women have a smoother path to trend on in pursuit of a professional architecture career and that all architects should be brave enough to put the depths of their imagination to paper and then worry about the how. A generosity of spirit will reap answers from multidisciplinary collaborators and friends.